For Christmas last year, the spirit of the Chinese government was simple: Forget Christ, celebrate Mao Zedong. A group of marchers gather under a large bronze statue of Mao Zedong in the Workers’ Cultural Garden and swear oaths to him. In light of that spirit, students at a middle school in a town in Binzhou city, in China’s eastern coastal province of Shandong, didn’t exchange gifts on Christmas Day as they used to do. 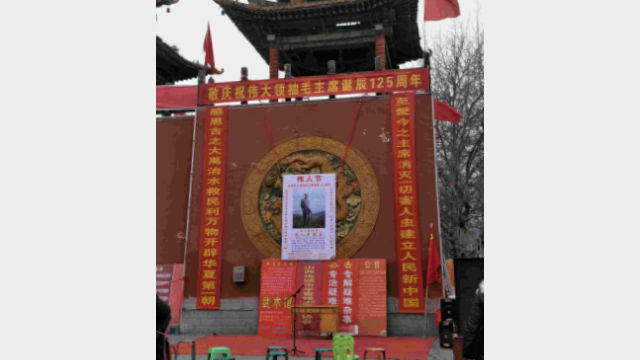 Instead, the day after, students celebrated a different “great man”: Chairman Mao, born on December 26, 1893. 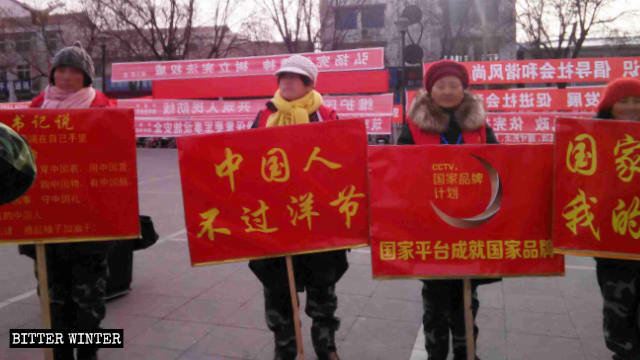 Slogans promoting Great Man’s Day in Yuncheng city, Shanxi province. Right in line with school requirements, each classroom gave accounts of Mao Zedong’s life by playing videos, telling stories, reciting his poems and singing songs in praise of Chairman Mao. A video widely shared on WeChat: A teacher tells students not to celebrate Christmas and to celebrate Great Man’s Day instead. 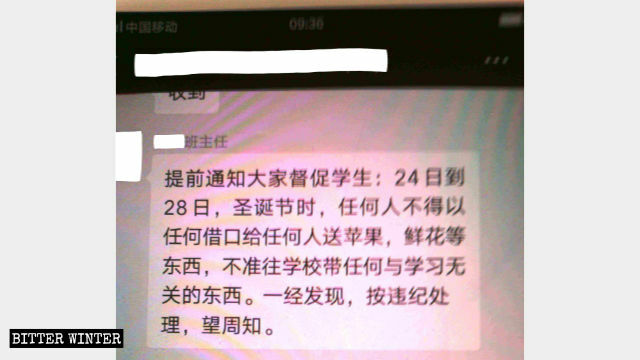 On December 25, 2018, school leaders at a middle school in Jiujiang city, in the southeastern province of Jiangxi, ordered students to tear up the Christmas decals they had prepared and rebuked students for only knowing how to celebrate the “foreign festival” – aka Christmas – and forgetting China’s actual festival, Mao Zedong’s birthday. The school’s leaders also declared that government agencies and schools couldn’t hold Christmas-related events. The following day, teachers played the song The East Is Red – the de facto national anthem during the Cultural Revolution – for students to commemorate the birth of Mao Zedong, and told students about the “glorious” history of the Communist Party. Of course, Great Man’s Day was not just celebrated at schools. About 100 employees from various work units in Yanhu district of Yuncheng city, in China’s northern province of Shanxi, held small red flags and wore Chinese red scarves as they shouted: “Don’t celebrate Christmas! Celebrate Great Man’s Day!” Some waved signboards with slogans boycotting foreign goods. 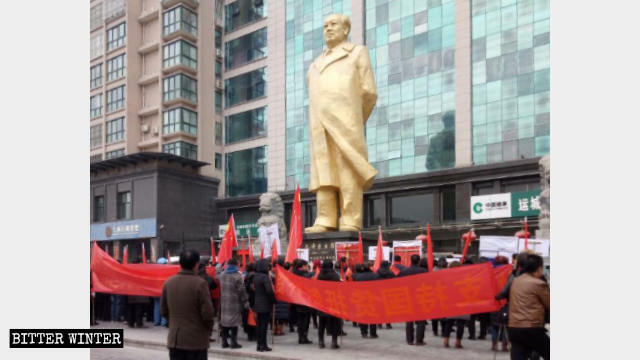 Afterward, a group of marchers gathered under a large bronze statue of Mao Zedong in the Workers’ Cultural Garden, where they swore oaths to the Great Man and shouted slogans. 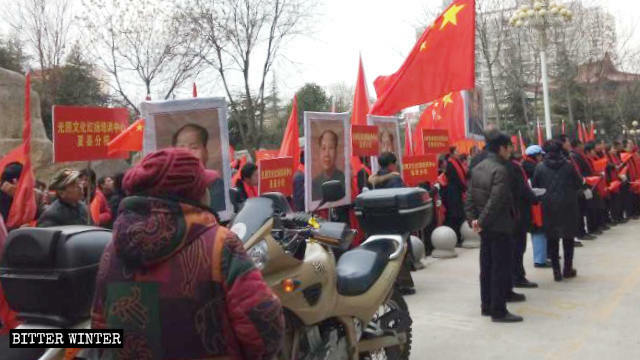 A group of marchers promoting Great Man’s Day in Yuncheng city, Shanxi Province. Videos circulating online show that similar demonstrations also took place in Shandong, Henan, and other locations across China. The demand that Great Man’s Day replaces Christmas is especially hard for Christians. Last year, in Shandong’s Dezhou city, a house church meeting venue was repeatedly raided by the police and was forced to shut down in November 2018. The same month, the person in charge of the church applied for the relevant permits to reopen the meeting venue. When she asked what conditions were required, she was told that aside from the standard procedures, the meeting venue would also be required to hang up the new Regulations on Religious Affairs and a portrait of Mao Zedong. Also, she would be prohibited from celebrating Christmas and instead, must observe Great Man’s Day on December 26. Unless she accepted these conditions, a permit would not be issued. And, if she were discovered to hold gatherings in the future, she’d be arrested and sentenced to prison. There’s another thing forbidden by the Chinese government over the Christmas season: The giving of apples – a tradition derived from the homophony of the Chinese words “Christmas Eve” (Píng’ānyè) and “apple” (píngguǒ). This inspection happened twice on the same day. One street vendor, who sells apples, said that not only were they not allowed to sell apples, but local students were afraid to buy apples on Christmas because their schools prohibited them from celebrating the holiday. Students carrying apples would be reprimanded if discovered. 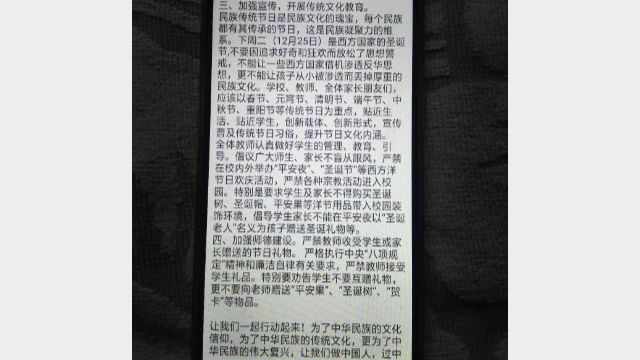 On December 24, the Education Work Committee of Linyi county in Shanxi’s Yuncheng city issued a notice, demanding that campuses within the jurisdiction strengthen students’ education in patriotic ideology, strictly prohibiting Christmas and other religious festivals from being celebrated on campuses. So much so that during the season, all schools are required to have dedicated personnel in place to conduct inspections at the school entrance – to confiscate flowers, apples or other Christmas gifts from students on the spot. 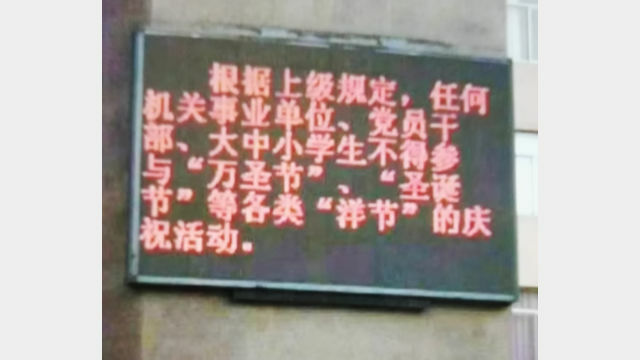 A notice prohibiting Christmas items from being carried at a school in Tieling city, Liaoning Province. 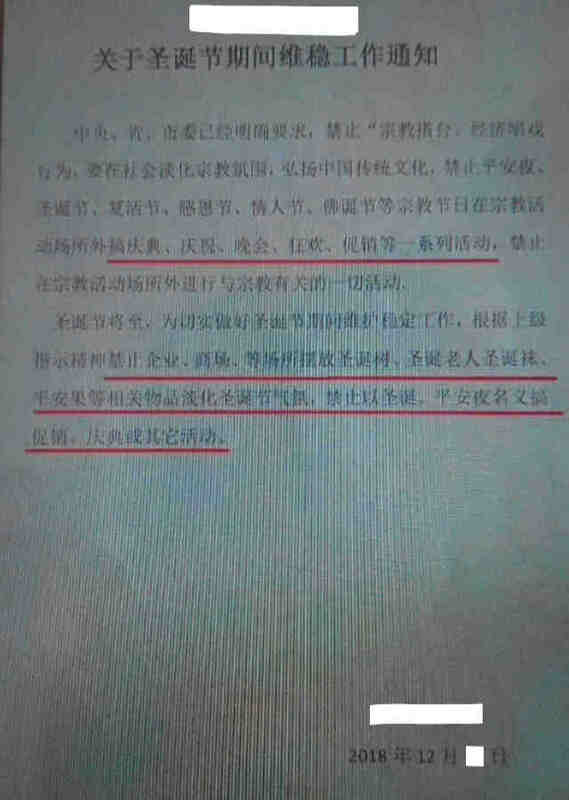 School officials in Langfang city, in northern province of Hebei, put forward an initiative demanding that all school personnel make their political positions more prominent and mandated that children should focus on Chinese holidays, such as the Spring Festival, the Lantern Festival, the Dragon Boat Festival, the Mid-Autumn Festival, and other traditional festivals. The initiative also demanded that teachers, students, and parents be prohibited from taking part in any Christmas celebrations over the holiday season. According to sources, similar notices prohibiting Christmas gifts from entering campuses were issued at some schools in Baotou city of Inner Mongolia, Shenyang and Tieling cities of Liaoning Province, to name a few. In some schools, students and teachers were prohibited from requesting time off during Christmas season – all part of the agenda to eradicate Christian belief. 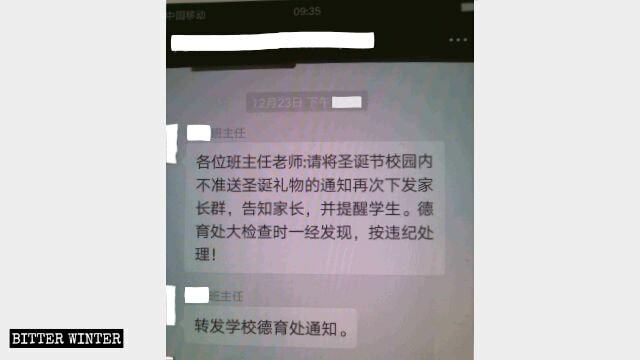 On December 24, a primary school in Hebei’s Hengshui city forwarded an order from the city’s United Front Work Department and the Commission for Discipline Inspection: “On Christmas Eve and Christmas Day, the government will establish a leadership team to conduct a thorough investigation; students and teaching staff who go to religious venues to participate in Christmas events will be severely punished, and school leaders will also be held accountable”. For most Chinese people, Christmas is merely an opportunity for entertainment and relaxation, but the government’s anti-Christmas actions have sparked feelings of resistance among some. “The more they don’t let me celebrate Christmas, the more I actually want to celebrate it,” one person said.